At the end of this year of conflict and turmoil, I look forward to making 2018 more of a ‘glass half full’ year. Towards that end, I offer the following checklist to make live events and the venues in which they’re held safer and more healthy places for ourselves, our peers, and our guests. 1. Accept people as they are. Faithful readers have seen my growing collection of photos proving that even professionals charged with thinking about safety have astonishing blind spots. Consequently, guests in crowded, loud, dark, unfamiliar places have virtually no “situational awareness,” which is why their rarely ‘see something’ or ‘say something.’ Event attendees often do not “Run, Hide, Fight” because all humans suffer from confirmation bias, which makes them incapable of recognizing that they are in serious danger. It makes no sense to assume that people at a show will react as decisively as they might in a military setting or an office building – history tells us they won’t. This is not a rainbow flag of acceptance (although I favor that too) – it is a plea to follow the legal duty to behave reasonably under the circumstances. 2. Plan for weather like someone’s life depends on it. The Event Safety Alliance was born in reaction to the horrific stage roof collapses of Summer, 2011, in Ottawa, Tulsa, Indiana, and Belgium. One would hope that four incidents in one season would be enough to permanently change industry practices, at least as to that one issue. But last week’s fatal incident in Brazil reminds us that one cannot skip steps when dealing with people’s lives. Modern weather prediction technology is more accurate than ever before, and well worth the modest expense even for small events. If you’re not already using a private weather consulting service and applying it to a severe weather action plan and trigger chart, now would be a great time to catch up. 3. Fix the easy stuff. It is tempting to read about the latest shooting or ramming incident, acknowledge that we are largely powerless to stop a motivated attacker, and just go back to bed. But there is so much we can do to make events safer that is well within our ability (and budget), that will address threats that are much more likely to occur. If you’re in production, make sure everyone wears appropriate PPE – you can use fun colors or designs to create esprit de corps. If you’re in operations, make sure your emergency plan provides information to everyone in the venue, even the people in black shorts working back of house who may have no idea what’s happening elsewhere unless someone tells them. 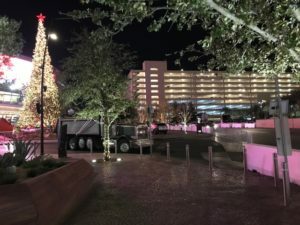 Management can talk with security about where people queue up before a show to see if something as simple as removable bollards (or public works trucks filled with dirt) can protect patrons from errant vehicles. I love the low-hanging fruit – talk to me if you want more ideas you can easily implement. 4. Incorporate safety into your marketing plan. It used to be that talking about safety made some people feel unsafe; I think that ship has sailed forever. Now, I am glad to see major companies building their attention to safety into their marketing plan. In the last couple of weeks, I had several conversations about using existing event-related platforms to promote safety planning for event organizers and messaging for attendees. Just as no one wants to become a buzzword for disaster (“Columbine?”), safety can be a selling point that distinguishes you from the competition. 5. Do a proper risk assessment. A basic risk assessment equation is Risk = Vulnerability x Consequences (R = V x C). Consider the risk of erecting a temporary stage roof, for example. It would be vulnerable to gravity, high wind, and construction defects. The consequences of a roof collapse range from property damage (probably covered by insurance) to death. There is not much you can do to reduce the risk of gravity, but you can have a high wind action plan and weather monitoring, and you can ensure that built equipment is inspected before it is put into service. These safeguards, in combination with good crowd management to keep people out of harm’s way, will reduce the risk to a reasonable degree under the circumstances. Which is what the law requires. 6. Prepare in advance to handle reasonably foreseeable risks. The tranquility of a dark day is a fine time to draft brief scripts to be read during certain foreseeable emergencies, such as a controlled evacuation due to weather or a fire alarm. Similarly, if you know you may need a policy about the use of PA and video to help manage the crowd, or whether house lights should be brought up or left down in different scenarios, why not write it and get staff buy-in before the next show? 7. Make sure there is enough insurance. Q. When something goes wrong, who gets sued? A. Everyone. That’s too obvious to be useful. The question whose answer you really care about is whether, if your employer or venue gets sued, will you win? In order to learn that answer, there must be enough insurance coverage to fight rather than just rolling over and paying blood money to settle. No one likes writing the checks for their insurance premium; but that pain pales in comparison to the frustration of not having enough coverage to defend your actions in a lawsuit. 8. Say what you mean, and mean what you say. Not to go all lawyer on you, but written materials (including representations on your web site and in emails and text messages) should say only what you mean, and promise only what you can actually deliver. “Truthful hyperbole” is not a thing – a clever plaintiff’s lawyer will use a defendant’s own statements to prove negligence by showing that the defendant failed to meet the standard it set for itself. 9. Document what you do well. People often ask if they should record and preserve what they do, or if it is better to work in secrecy. I always answer that if they are doing good work and making decisions that are reasonable under the circumstances, then they should be proud to have other people know it. Even when something bad happens, I am happy to see a comprehensive emergency action plan, detailed incident reports and thoughtful after-action reports, and contemporaneous photos and video. These all make it easier to know what happened after memories fade. Besides, nothing is truly secret anymore; my phone, like yours, is so much more than an oral communication device, and every recent incident I can think of almost instantly appeared on Youtube. 10. Try to maintain perspective. At the Event Safety Summit a few weeks ago, we featured an important but heartbreaking session about mental health and wellness among event professionals. As much as I am embedded in the industry in many respects, discussions like that make me appreciate the extent to which my daily reality is different. (Long ago, I stopped caring whether the practice of law attracted jerks or made them.) In the event industry, we make our living doing things that appear on most people’s bucket lists. I firmly believe that providing opportunities for other people’s amusement should not jeopardize our health or safety, or that of the people around us. I am going to try to keep this perspective in my own work, and I hope you do too.